Is the Kindle Fire the Best EBook Reader ? Ask Dave Taylor: Is the Kindle Fire the Best EBook Reader ? Since I assume you see them all, Nook or kindle, color or black and white? Bbased on best overall value, usefulness and ecosystem. 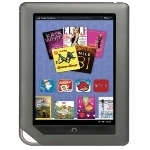 Leaning toward kindle fire due to Amazon ecosystem and prime… plus free book rentals from library. You ask a tricky question, because there’s a plethora of really good ebook readers on the market priced from $79 on up to over $500. The difference is in screen size, power and capabilities. Amazon’s actually muddied the water a bit too because you can get the Kindle reader software app on a wide variety of additional devices, including an Android tablet like the Samsung Galaxy Tab 10.1 or even Galaxy Note, for that matter, and you can run it perfectly well on an Apple iPad. Oh ho, you say, those are nice, but crazy expensive. Well, yes and no. The Kindle Fire comes in at a very nice price point, $199, but it’s also limited in what it can do and is slow if you’re planning on running any sort of apps at all on the device rather than use it as a dedicated reader. The screen is gorgeous and there are a surprising number of different Kindle-approved apps in the Android app marketplace: The Kindle Fire in our office has about fifteen apps we’ve downloaded, including some quite attractive games like Plants vs. Zombies and Bejeweled. The real winner in the ebook space, however, are the non-color Kindle devices that offer a super low entry point and still have quite attractive screens and the eInk technology that gives the devices battery lives measured in weeks, not hours. The very lowest of the line is priced at $79. Rather hard to go wrong. Want a bigger 10″ screen? Then your least expensive option — new — is about $379 for a Kindle DX, which really is still a dedicated device with essentially no third party apps whatsoever. Ask Dave Taylor ask dave taylor, ebook, kindle fire. permalink. Dave, I downloaded kindle to my computer and it took all the information off my wife’s kendle. I am in trouble now. Will you please help me send it back to her kendle fire. I would apppreciated it very much.